Encore: S. Moniuszko: Highland Dances from the Opera "Halka"
Sir Simon is one of the finest and most charismatic conductors working today, using his baton like a magic wand to transform sounds into pure musical gold. During the 1980s and 1990s he helped to turn the rather provincial City of Birmingham Symphony Orchestra into an internationally-acclaimed ensemble. The British artist went on to lead the Berlin Philharmonic Orchestra, spending 16 years honing their incredible artistic skill and world-famous velvety sound. 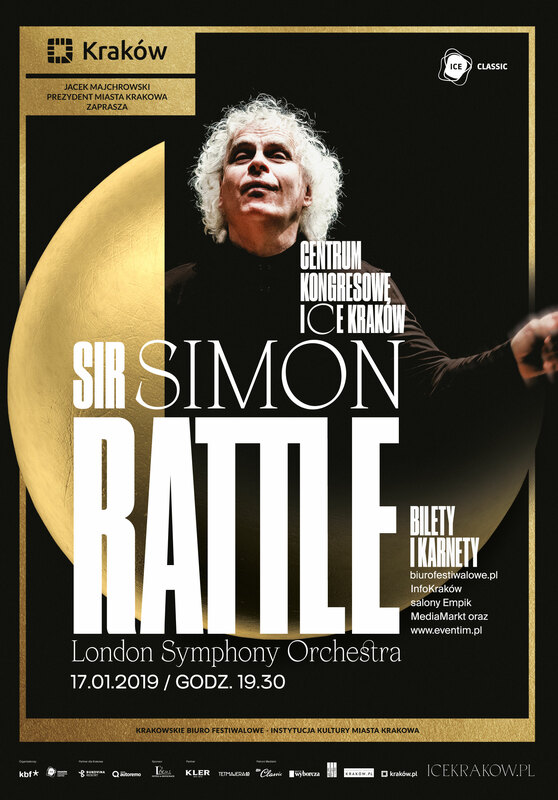 Sir Simon has been in charge of London’s longest-running orchestra since September 2017; the iconic musicians famously select their own conductors, with past maestros including André Previn, Claudio Abbado and Valery Gergiev. Led by the conductor, the London Symphony Orchestra has been universally acclaimed and their second season together features influences from contemporary music, folk inspirations and unexpected combinations. The concert at ICE Kraków will be the perfect illustration: we will hear Béla Bartók’s unsettling Music for Strings, Percussion and Celesta (used as part of the soundtrack to the cult horror The Shining), and Anton Bruckner’s Symphony No. 6; rooted in Romanticism, parts of the piece feature unmistakeable elements of Expressionism. Sir Simon Rattle was born in Liverpool and studied at the Royal Academy of Music in London. From 1980 to 1998, Sir Simon was Principal Conductor and Artistic Adviser of the City of Birmingham Symphony Orchestra and was appointed Music Director in 1990. He moved to Berlin in 2002 and held the positions of Artistic Director and Chief Conductor of the Berliner Philharmoniker until he stepped down in 2018. Sir Simon became Music Director of the London Symphony Orchestra in September 2017 and spent the 2017-18 season at the helm of both ensembles. Sir Simon has made over 70 recordings for EMI record label (now Warner Classics) and has received numerous prestigious international awards for his recordings on various labels. Releases on EMI include Stravinsky’s Symphony of Psalms (which received the 2009 Grammy Award for Best Choral Performance) Berlioz's Symphonie fantastique, Ravel’s L'enfant et les sortileges, Tchaikovsky’s Nutcracker Suite, Mahler’s Symphony No. 2 and Stravinsky’s The Rite of Spring. From 2014 Sir Simon continued to build his recording portfolio with the Berliner Philharmoniker’s new in-house label, Berliner Philharmoniker Recordings, which led to recordings of the Beethoven, Schumann and Sibelius symphony cycles. Sir Simon’s most recent recordings include Debussy’s Pelléas et Mélisande, Turnage’s Remembering, and Ravel, Dutilleux and Delage on Blue-Ray & DVD with the London Symphony Orchestra’s record label, LSO Live. Music education is of supreme importance to Sir Simon, and his partnership with the Berliner Philiharmoniker broke new ground with the education programme Zukunft@Bphil, earning him the Comenius Prize, the Schiller Special Prize from the city of Mannheim, the Golden Camera and the Urania Medal. He and the Berliner Philharmoniker were also appointed International UNICEF Ambassadors in 2004 - the first time this honour has been conferred on an artistic ensemble. Sir Simon has also been awarded several prestigious personal honours which include a knighthood in 1994, becoming a member of the Order of Merit from Her Majesty the Queen in 2014 and most recently, being given the Freedom of the City of London in 2018. From 2013, Sir Simon took up residency at Baden-Baden Osterfestspiele performing Die Zauberflöte and a series of concerts with the Berliner Philharmoniker in his first season. Since then the partnership led to performances of Puccini’s Manon Lescaut, Peter Sellars’s ritualization of Bach’s St. John Passion, Strauss’s Der Rosenkavalier, Berlioz’s La damnation de Faust, Wagner’s Tristan und Isolde and most recently, Parsifal in 2018. For Salzburg Osterfestspiele, Rattle has conducted staged productions of Fidelio, Così fan tutte, Peter Grimes, Pelléas et Mélisande, Salome and Carmen, a concert performance of Idomeneo and many contrasting concert programmes. He has also conducted Wagner's Der Ring des Nibelungen with the Berliner Philharmoniker for Festival d'Aix-en-Provence and Salzburg Osterfestspiele and most recently at the Deutsche Oper Berlin and Wiener Staatsoper. Other recent opera productions for Sir Simon include Pelléas et Mélisande and Dialogues des Carmélites for the Royal Opera House; L'Étoile, Aus einem Totenhaus, Káťa Kabanová and La damnation de Faust for the Deutsche Staatsoper Berlin, and Andrew Norman’s A Trip to the Moon at the Barbican Centre, London. Sir Simon has longstanding relationships with the leading orchestras in London, Europe and the USA; initially working closely with the Los Angeles Philharmonic and Boston Symphony Orchestra, and more recently with The Philadelphia Orchestra. He regularly conducts the Wiener Philharmoniker, with whom he has recorded the complete Beethoven symphonies and piano concertos with Alfred Brendel and is also a Principal Artist of the Orchestra of the Age of Enlightenment and Founding Patron of Birmingham Contemporary Music Group. During the 2018-19 season Sir Simon will embark upon tours to Japan, South Korea and Europe with the London Symphony Orchestra. He will conduct the Czech Philharmonic Orchestra for the first time in Mahler’s Das Lied von der Erde and will return to the Deutsche Staatsoper Berlin for Hippolyte et Aricie, the Symphonieorchester des Bayerischen Rundfunks for Die Walküre and the Berliner Philharmoniker for Puccini’s Manon Lescaut. In March 2019 he will conduct Peter Sellars’ revival of the St. John Passion with both the Berliner Philharmoniker and the Orchestra of the Age of Enlightenment.